We spent a few days in Seattle preparing for our next city, Portland OR. We hoped to organize something there, so we got in touch with friends and caught a train down (we know, not quite biking but hey! the time we saved we can spend in the city instead =). The day before leaving we met with Alec, a friend who lives here. You can see a small video of us riding around the waterfront leading into Seattle. We then hopped on the Amtrak train, and headed for Portland. 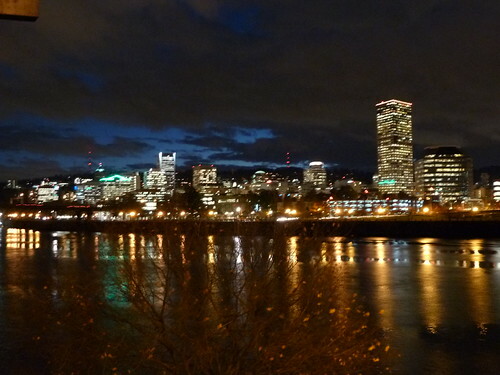 We’ve spent a few days here in Portland, and it’s really a great city (as far as we can tell!). There’s more cyclists here than I’ve seen in my life, and that just feels so warm and fuzzy (even though the weather’s been cold and cloudy). There are bike paths left and right, bike parking corrals everywhere, and in general it’s super easy to get around on a bike. There’s also a bunch of coop stores where people seem to really have a sense of belonging, and “buy local, buy organic” seems like a mantra everywhere. One of the first places we checked out was the Red and Black Cafe, a vegan, anarchist cafe in SE Portland. If you ever come to town you MUST go! =) Super awesome people work there, the food’s tasty, and the angry letters the get (and posted on their windows) are hilarious! Then we super-quickly checked out City Bikes. This is a sort-of OCB bike shop, but with much less emphasis on teaching and letting people do their thing. It’s still a coop bike shop, and they have used parts for cheap and are super friendly. Check it out if you can. Then we checked out PSU as we postered for our event on Tuesday evening. We talked to the cool peeps at Las mujeres, a chicana/latina women’s student group at PSU, who linked us with Movimiento Estudiantil Chicano de Aztlan. We unfortunately didn’t spend enough time with these collectives to get to know more about what they’re up to, but they’re pretty cool! We also gave a small presentation to Ben Cushing’s Globalization class at PSU. The students were really interested in some of the ideas we were presenting, and we had a really cool discussion about CIPO and bikes. Later that evening we went to the more public presentation we organized also at PSU. Around 30 people came to the event, and they were ALL super awesome people =) Some we knew, but most were new, now friends. Our friends from Olin came to make a strong presence, and it was just too awesome to see familiar faces we hadn’t seen in so long. We met people who work in a media collective called the B media collective, and in other people connected to the community. We gave a presentation about our trip, about CIPO-RFM, and about the Agriculture Workers Alliance. The discussion was rich and engaging, and we delved into issues of autonomy, community organizing, the history of CIPO-RFM, and tactics that both CIPO-RFM and CIPO-VAN use. We were also asked about indigenous movements in Canada, and about the transnational or cross-border nature of our work, and how we conceive that affects us or opens possibilities. Then this morning we made the trek out to Woodburn, OR to meet with the good people at Pineros y Campesinos Unidos del Noroeste, Oregon’s union of farmworkers, nursery, and reforestation workers, and Oregon’s largest Latino organization. They invited us for an interview at Radio Movimiento, 95.5 AM. There we talked primarily about the Agriculture Workers Alliance work and the situation of agriculture migrant workers in Canada. It was really awesome to get to know PCUN and their morning radio show. Oh yeah! but there’s an awesome side-story to this! When we contacted PCUN, they invited us out for the interview at 8 am today, and we thought “hell yes, no problem!” Then we asked how to get there and found out Woodburn is like 30 miles away! It would’ve meant a bike ride leaving Portland at around 3 am to get there in time. So we thought we’d have to cancel or do it by phone. So being kinda sad about that we went for dinner at some friends’ place after the PSU event. Once there one of them told us “oh! you can borrow our car!” And so we hopped on their super funky old diesel-based Mercedes. The thing had only one good headlight, and rattled like a broken drying machine when just idling! It was definitely an adventure to get on the highway on it, but we did make it and we were really lucky to be able to borrow a car in a pinch =) You can actually see a small video of our car trip here!